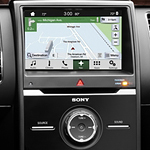 There are a few things to look for in a good infotainment system. You definitely want to get integrations like Apple CarPlay and Android Auto. Bluetooth connectivity is a minimum requirement here. You also want to be able to voice control your vehicle, allowing you to make calls hands-free, as well as control traffic alerts, GPS, and other safety features. Want to access infotainment systems that are truly advanced? Get the best for in-car entertainment with a new-to-you vehicle. Test drive and see the options at Perkins Motor Plex.